The latest evidence that government dominance of research funding holds back useful progress is a complaint in a March 17, 2018, Science News article on postpartum depression. Imagine that you are a grant-writer at a business, a college, a foundation, or some other institution that performs research, and you have the opportunity to recommend a funding request. 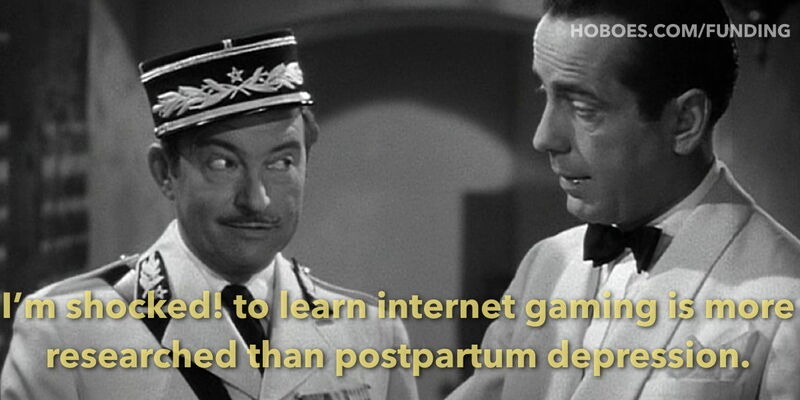 Your choices are internet gaming disorder and postpartum depression. One has the potential to show how the Internet should be further regulated to keep people from harming themselves with Internet addiction; the other has the potential to help millions of women who suffer from a serious and sometimes deadly illness. Which do you recommend? All other things being equal, it will probably depend on what your interests and your institution’s interests are. If they lie toward gaming or Internet issues, you may go with the first. If they lie toward maternity issues or medical sales, and you want to profit from your results, you might go with the second. But what if all things aren’t equal? What if the majority of funds come from government bureaucracies? Then you have the real world, in which “more than four times as many [human brain imaging studies] have been conducted on a problem called ‘internet gaming disorder’” than on postpartum depression. And that compares, on one side, only five years of research, and on the other, decades. This is a result that only makes sense in a world where government funding swamps private funding. It means government’s needs—justification for more laws—take precedence over the majority of people’s needs. It puts the desires of politicians—more opportunities to milk donations from rich industries—over the needs of everyone else. In a sane world, we’d be complaining about the mad rush to profit off of women’s misery, not about ignoring that potential profit. The sheer numbers of potential customers for a solution to postpartum depression would turn our current disparity upside down and spike it. Instead of pouring money and time into the latest fleeting infatuations of politicians and government bureaucracies, we’d be solving a problem that potentially affects half the population. That really sounds like government funding holding progress back. In response to The plexiglass highway: Government bureaucracies can cause anything to fail, even progress. Schweizer turns the problem of corruption around, and in doing so makes it much easier to understand and to combat. If we look at the problem as one of extortion by politicians rather than of bribery by lobbyists, it is a lot easier to understand why the “bribes” happen when and how they do. There will always be an infinite source of people affected by legislation, making combatting bribery impossible. In most other industries, regulations apply to sellers, not buyers, for the simple reason that it’s more effective: there are always fewer sellers than buyers. And politicians are not passively waiting for bribes. They are actively attempting to force people, businesses, and entire industries to send them money. Do performance mandates matter? They’re arguably better than prescriptive mandates, but they still divert progress away from real progress and toward bureaucratic definitions. More evidence that the CDC cannot be trusted doing research on firearms ownership. Did government funding help keep Flint’s water unsafe? When researchers rely on government funding to keep their jobs, it should come as no surprise that they aren’t eager to publish findings that reflect badly on those government agencies that fund them. Government Funding Disorder last modified April 10th, 2018.